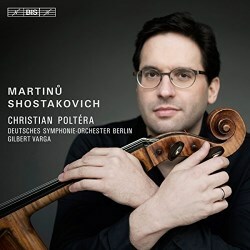 This is the second recording of the Zürich-born cellist Christian Poltéra with the Deutsches Symphonie-Orchester Berlin (BIS), Poltera having previously recorded Martinů’s first concerto and Dvořák’s sole completed concerto. The works on the current disc, the second cello concertos by Shostakovich and Martinů, stem from the late styles of both composers. In either case, emotional immediacy and an eye for virtuosic display from their popular first cello concertos are replaced with a sense of free-flowing introspection. If the late paintings of J.M.W. Turner or Rembrandt come to mind, these works are conjoined by their unworldly qualities where divisions between form and formlessness, absence and presence, and the intended and accidental are no longer assured. Shostakovich’s sparsely orchestrated concerto (1966) invites listeners to a world of bleak quietude, an eerie meditation on fragility and grit. The full orchestra, although rarely employed, pursues a sardonic dance in the finale, moments before a resigned conclusion. Poltéra’s approach is essentially lyrical; his penchant for rightness of tone and singing qualities are rarely compromised for effects. Listening to the accounts by Rostropovich/Ozawa (DG) or Müller-Schott/Kreizberg (Orfeo) however, Poltéra’s reading is wanting, lacking the quintessential acerbic and ominous qualities. Consequently expressions of the various contrasts in this multi-shaded work, from sincerity and irreverence to aggression and sensitivity, are attenuated. The cello and bass drum interplay from the Largo (9’00”) shies away from being genuinely haunting – the overly subdued percussion is particularly damaging. Furthermore, the unsparing cello passage leading up to the cataclysmic orchestral tutti in the last movement (8’30”) feels rather too polished. As such, Poltéra and Varga’s apollonian reading risks neutralizing something that is inherently troubled, ultimately circumscribing the quiet anguish the work evokes. If Shostakovich’s concerto delves deep into the abyss of the human psyche, Martinů’s dreamlike concerto (1944/1945) seeks profundity by means of transcendental joy. An idiosyncratic amalgam of ethereal harmonies, rhythmic inventiveness and Czech flavours, the syntax of Martinů’s inimitable late style is striking. Virgil Thompson’s perceptive comment that Martinů’s music “sings as well as shines” is no light praise. Where Wallfisch/Bělohlávek’s (Chandos) celebrated rendition is attractive for its pursuit of gentleness, the occasional lapse in clarity and its distinct smoothness may leave an impression of stodginess. As if to address these issues, Poltéra and Varga give an excitingly alert reading, illuminating the orchestral and rhythmic details of this luminous score. The acceleration at 4’30” of the Moderato, for example, incites unusual vigor. If Poltéra’s lyrical poise caused concern in the Shostakovich concerto, such a stylistic attribute befits Martinů’s spirited lyricism. Although a marginally slower tempo may have benefitted the innocently reverent Andande poco moderato, the transitions between the movements are superbly achieved. If anything, the vital Allegro gives a sense of uplifting finality. All that came before is justified in this radiant coda. Beyond the fact that the disc presents two works that deserve further attention, the stellar performance of the Martinů concerto alone makes this disc commendable. Both works are warmly recorded in SACD quality. The level of reverberation is ideal.